include and encourage all Lancashire Heeler owners in our activities and breeding programmes. The breadth of our gene pool has a direct correlation to the longevity of the Lancashire Heeler breed"
This project is the result of ideas from the Lancashire Heeler community. 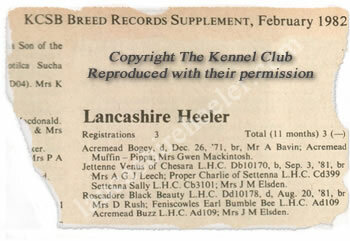 At its core is a Lancashire Heeler Database of pedigrees which we can all contribute to. This resource offers the ability to for all to submit pedigrees and pictures allowing every Lancashire Heeler owner the opportunity to interact with the history of the breed and influence its future welfare. This site is independently provided and has recently been re-built. An aim of the work of this project is to enable us to remember and acknowledge the work of the breeders who put so much into the recognition and promotion of the Lancashire Heeler without whom we would not be able to enjoy this historic breed today. You are now able to add and edit your dogs and upload pictures. If you have any problems please contact me. 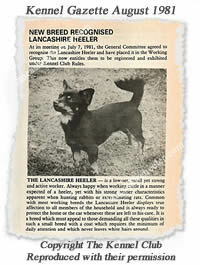 Enjoy browsing the Lancashire Heeler Pedigrees!